In John chapter 10, Jesus compares himself to a shepherd. There are two very different sides to that comparison– one, very exalted and the other very humble. His hearers could choose to hear it however they liked. Both were true. On the one hand, Jesus is alluding to that familiar and popular 23rd Psalm. “The Lord is my Shepherd,” says the Psalmist, and a very good one at that, he goes on to say; ‘leading me beside the still waters, making me to lie down in green pastures, guiding me along right pathways, comforting me and protecting me even in the valley of the shadow of death, and so forth.’ Jesus hearers were already familiar with that verse and image. And then Jesus, who at that time was still just a popular preacher, said HE was the good shepherd. Some people were starting to wonder if he meant that Psalm 23 Good Shepherd, the Lord God Almighty. Already by the very next chapter, some are ready to believe that he was that Good Shepherd, and others are ready to kill him for saying such a thing. Therefore, on the one hand, it was an outrageously arrogant thing to say; unless, of course, he was indeed God. But they did not all know or believe that yet. On the other hand, shepherds, even those who owned their own sheep, were looked down upon at that time. People didn’t want to be shepherds. You did that only if you could not find anything else to do. The hours were long, the work was dangerous, and the pay wasn’t all that good. And, you were under the obligation to the sheep around the clock. You were not just on call 24 hours a day, you were on duty all day and all night; for many days at a time. I’ve known shepherds, African students at the seminary, who could remember well the long days and nights spent alone and far from home. It was an entry level job, with minimum wage. It was not the kind of job you would be bragging about, but one you would keep only as long as you had to. On your days off, you’d be checking the want ads. Yet, the Son of God was humble enough to call himself a shepherd, and compare his work to that of a shepherd. Yes, on the other side of this comparison is the 23rd Psalm, but many people may not have had that in mind yet. Those who first heard those words could have interpreted them in two very different ways. But one thing is for sure, the average person would never have applied such a comparison to themselves; not in the spirit of Psalm 23 which would have been blasphemous, and not as that type of lowly worker. 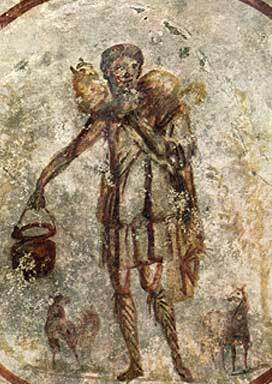 This is one of the earliest known images of Jesus, and it is of him as the Good Shepherd. Where are you pasturing your flock, O good Shepherd, who carry the whole flock on your shoulders? Show me the place of peace, lead me to the good grass that will nourish me, call me by name so that I, one of your sheep, may hear your voice, and by your speech give me eternal life. Amen.